A simple cake: tangy, refreshing and with the level of indulgence needed to satisfy any cake craving! 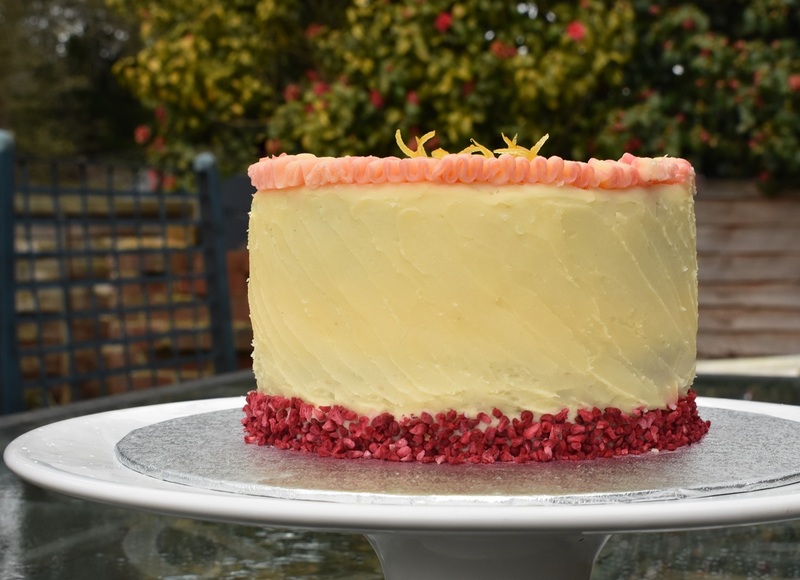 When I heard Meghan and Harry were to have a lemon and elderflower cake I was excited that they were going for such wonderfully vibrant flavours, rather than the traditional fruit cake. I love these two flavours so I decided to do my take on a lemon and elderflower cake. The sponge here is a standard all-in-one Victoria Sandwich sponge, flavoured with elderflower cordial and lemon zest. I have gone for my usual approach of weighing out the flour, butter and sugar based on the weight of the whole eggs: ie) whatever the eggs weigh, go for exactly that amount for the flour, butter and sugar. A 4-egg mixture will give a generous depth of sponge if using two 7″ round tins, or using three 6″ tins. 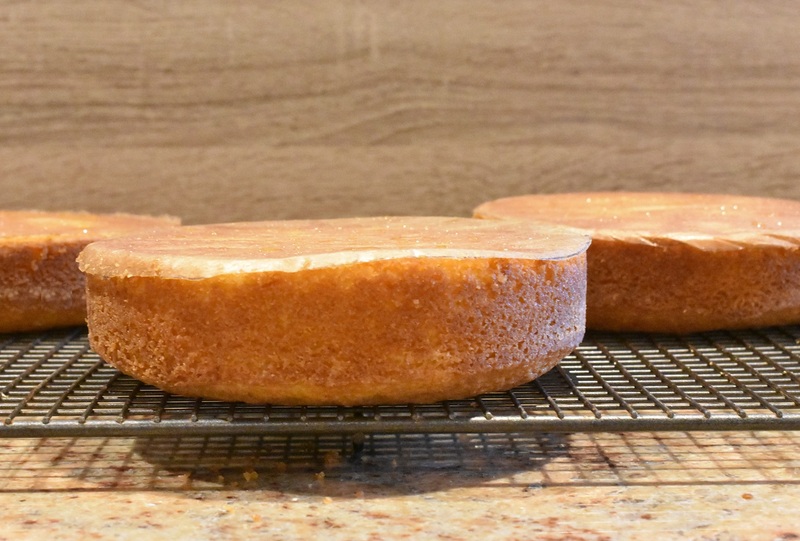 I often use 6″ tins, using two of the sponge layers for the main cake and then top the remaining sponge as extras! I make up a simple drizzle to go over the just-baked sponges before topping with a lemon and elderflower buttercream. You don’t need to add to much as you don’t want the sponges to be sodden: just a couple of tablespoons over each layer of sponge. I made a lot of elderflower cordial last year, so it was great to use some of it in this cake. A good commercial cordial also works well. 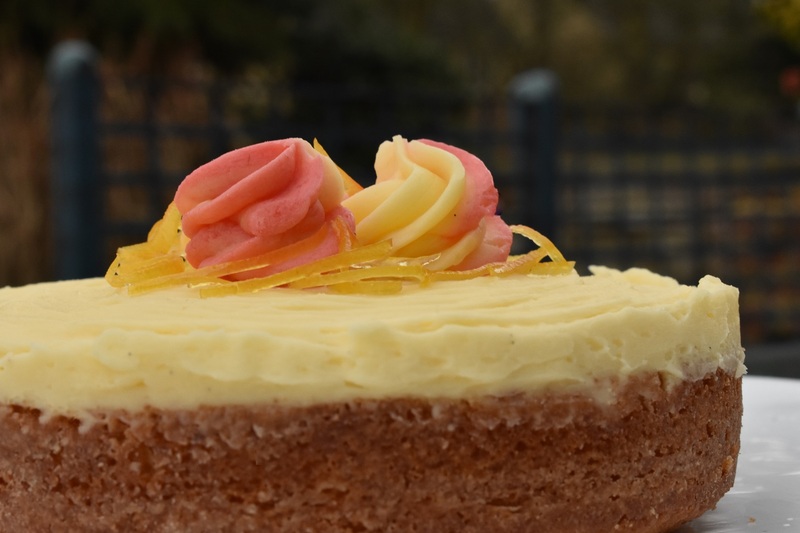 This buttercream is flavoured with lemon curd (the best quality you can find) and the cordial. It is both sharp and fragrant, as indeed it should be, without being too sweet. When adding liquids to buttercream (the cordial in this case), you need to add them a little at a time, otherwise the buttercream can curdle. However, the addition of melted (and cooled!) white chocolate will stabilize the buttercream, allowing you to get the cordial in there to give you a clear flavour of the elderflower. finely grated zest of 3 large lemons* base the weight of the flour, butter and sugar on the weight of the whole eggs: same wright as each for ideal results. (1) Grease and base-line two 7″ cake tins and preheat the oven to 160C(fan). (2) For the sponge, sift the flour and baking powder into large bowl and mix together with the remaining sponge ingredients until you get a smooth mixture. Don’t over-beat, otherwise the cake will be dense. (3) Divide equally between the tins and level off. Bake in the centre of the oven for about 25-30 minutes or until well-risen and golden brown. The sponge should just be coming away from the edge of the tin. Leave the sponges in the tin for about 5-10 minutes before inverting carefully onto a wire rack. Remove the greaseproof bases. (4) Mix the drizzle ingredients together and taste: you should have the sharpness of lemon with the lovely flavour of elderflower coming through: add more elderflower if you feel it needs it. NB: you don’t need to let the sugar dissolve (the grainy bits of sugar are what you want in a drizzle). (5) Spoon the drizzle over the still-warm sponges and leave them to cool fully. (6) Make the buttercream by beating the butter and icing sugar together for a few minutes until very smooth and creamy. 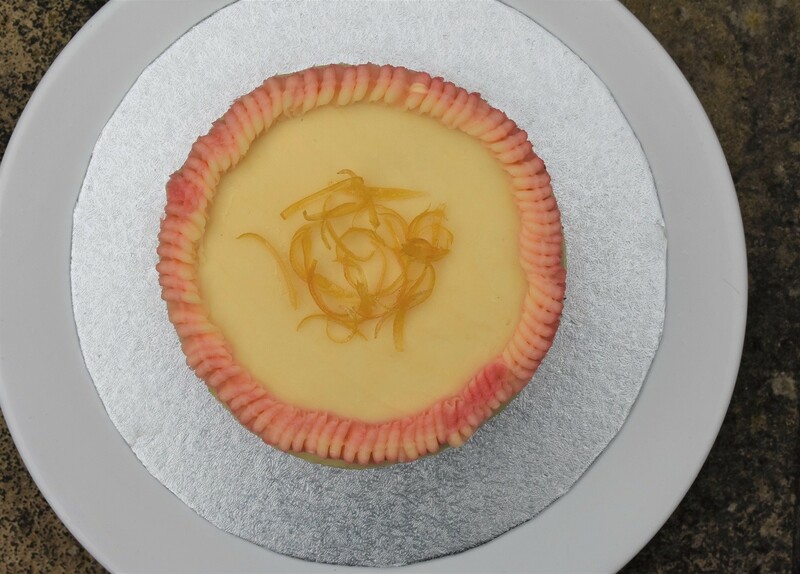 Beat in about half of the lemon curd and cordial, along with all of the white chocolate mixing well to help it incorporate. Beat in the rest of the cordial and lemon curd. Taste and add more lemon curd or cordial (gradually) if you think it needs more of either. (7) Sandwich the sponge layers together with the buttercream and coat fully with buttercream. Decorate any way you choose: I used some freeze-dried raspberries around the base and some thin slices of lemon peel that I simmered gently in sugar and water for about 30 minutes. 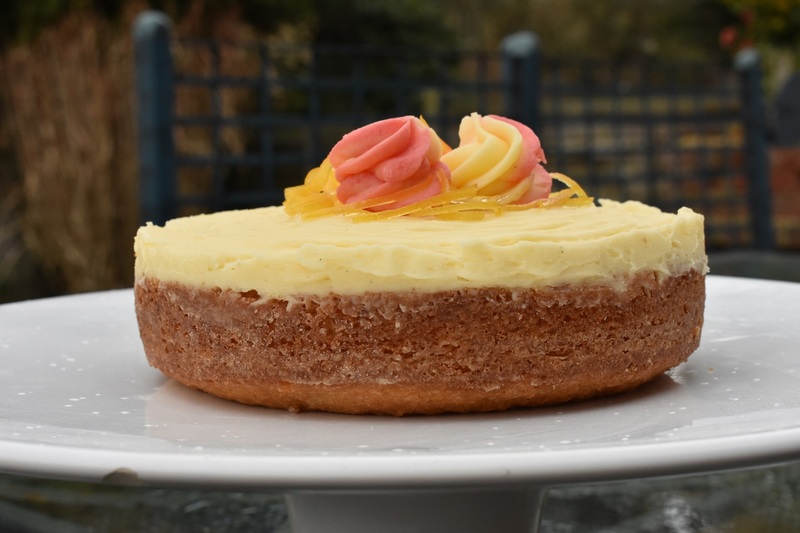 and also your tip about the buttercream is great too – nothing worse than curdled buttercream right at the final stages of beating… it is a nightmare! yes I now swear by weighing the eggs for cakes. Agh curdled buttercream: it is one of those heart-stopping moments in the kitchen when it happens! indeed… I have a blog post about elderflower macarons, did just that… it was one of my favorites!